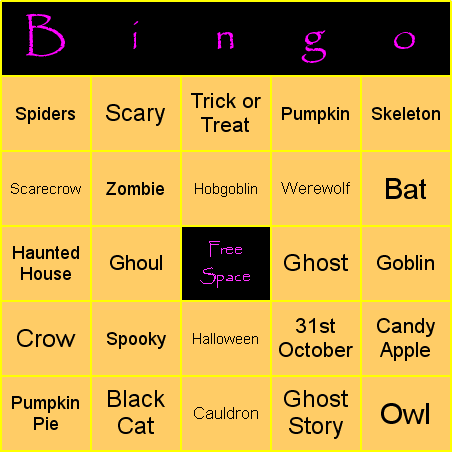 Each player (child in the case of school groups) is given a bingo card containing a different random selection of Halloween-related words, and a marker pen (or set of counters). The host (or teacher in the case of school groups) reads out words from the list in a random order. The host/teacher can use a call sheet containing a randomized list of the words (like the example in our printables - see below). Or, the host/teacher can prepare slips of paper with one word from the list written on each. These slips are placed in a bag, and the host/teacher then draws them out one at a time. The players then look for that word on their bingo card. If they find it, they cross off that square (or cover it with a counter). Additionally, the players can mark off the "Free Space" square in the middle of the bingo card, whenever they want. The winner is the first player to achieve a winning pattern and call out "Bingo!" (the host/teacher should check their card at this point). If you want to play a long game: The winning pattern could be to mark off every square on the bingo card. If you have lots of players, and want to have multiple winners: You could have multiple winning patterns - the first winner is the first player to mark off all four corner squares, the second winner is the first player to get a straight line of five marked off squares, the third winner is the first player to get two intersecting lines of five, and the fourth winner is the player who is first to mark off all the squares on their bingo card.